If you’re one of the more than 18 million Americans with diabetes, you are at high risk for heart attack and stroke. Heart disease is more likely to strike you – and at an earlier age – than it is to strike your friends and family without diabetes. In fact, 2 out of every 3 people with diabetes will die of a heart attack or stroke. But you can fight back. 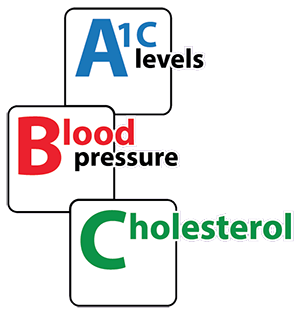 You have the power to prevent heart attack and stroke by controlling the ABCs of diabetes. A is for A1C. The A1C test (sometimes known as the HbA1c or hemoglobin A1c test) measures your average blood glucose (sugar) over the last 3 months. What are my ABC numbers? Your A1C level should be tested at least twice a year. Blood pressure should be checked at each visit and cholesterol should be tested at least once a year. What should my ABC target numbers be? For most people with diabetes, the goals are A1C below 7, blood pressure below 130/80, and LDL cholesterol below 100. What actions should I take to reach my ABC target numbers? You and your health care provider will put together an action plan of lifestyle changes and medications, if needed, to help you reach and maintain your goals for the ABCs of diabetes. • Get at least 30 minutes of physical activity, such as brisk walking, on most days of the week. • Eat less fat and salt. • Eat more fiber – choose whole grains, fruits, vegetables, and beans. • Stop smoking – ask your provider for help. • Take medicines as prescribed. • Ask your doctor about taking aspirin. • Ask others to help you manage your diabetes. For more information on the link between diabetes and heart disease, contact NDEP at 1- 800-438-5383 or http://www.ndep.nih.gov. The National Diabetes Education Program promotes awareness of the ABCs of diabetes through its Be Smart About Your Heart. Control the ABCs of Diabetes campaign. NDEP, the leading federal government source of information about diabetes prevention and control, is sponsored by the National Institutes of Health (NIH) and the Centers for Disease Control and Prevention (CDC) and 200 public and private partners.